The Black-capped Chickadee is a common songbird of Pennsylvania and the Northeastern United States. If you live in the Northeastern United States you are lucky to be in a region that supports a diverse array of bird species. The fields, woodlands and water sources of the Northeast, combined with the patchwork of yards and lawns, presents an ideal situation for many songbirds. Birds are everywhere, but if you haven’t stopped to pay attention you may not realize just how many interesting songbirds you can see right in your own backyard. You don’t have to make a special trip or trek into the woods to see the birds listed in this article. If you live in a rural area, chances are they are already coming to your property now and then. If you live in a city, sitting on a park bench for any amount of time will likely mean you’ll see a few. Putting up an inexpensive bird feeder will increase your chances of spotting some of these amazing birds. Or, why not take some easy steps to transform your property into a bird sanctuary? Adding a water source such as a birdbath as well as some natural vegetation will attract species that will not come to your bird feeder. Here are some of the most common songbirds of the Northeast. The American Goldfinch is a small yellow-and-black bird, and one of the most vibrant you will see in your yard. The male has striking bright-yellow plumage with a black cap, where the female has a duller yellow-brown color and no cap. In the winter, both sexes molt into an olive-brown color. The Goldfinch is a seed-eater who will readily come to your bird feeder. Sunflower seeds are a favorite, as is njyer or thistle seed. Even better, plant a few sunflowers and allow natural thistle to grow in your yard and watch the little Goldfinch harvest straight from the plants in the late summer and autumn. A common sight in yards throughout the Northeast, the American Robin is perhaps the most visible of any bird on this list. It is easy to recognize with its orange breast and dark gray back and head. The American Robin will not come to a seed feeder, but you may attract it using a ground feeder stocked with mealworms or similar. However, there is really no need to go out of your way to bring this bird around. It will happily hunt worms, grubs and insects in your yard throughout the spring and summer. 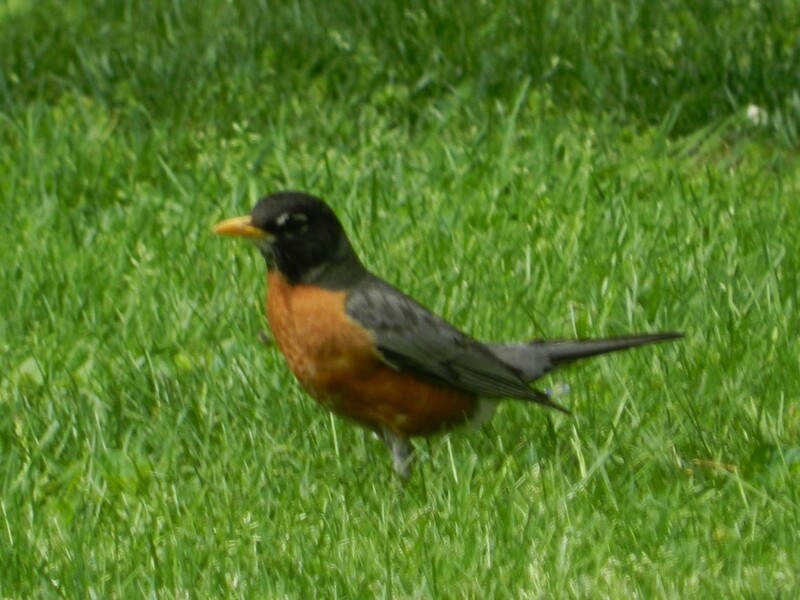 In most areas of the Northeast the American Robin migrates south in early autumn and returns in early spring. Here is another bird that will not come to your seed feeder. 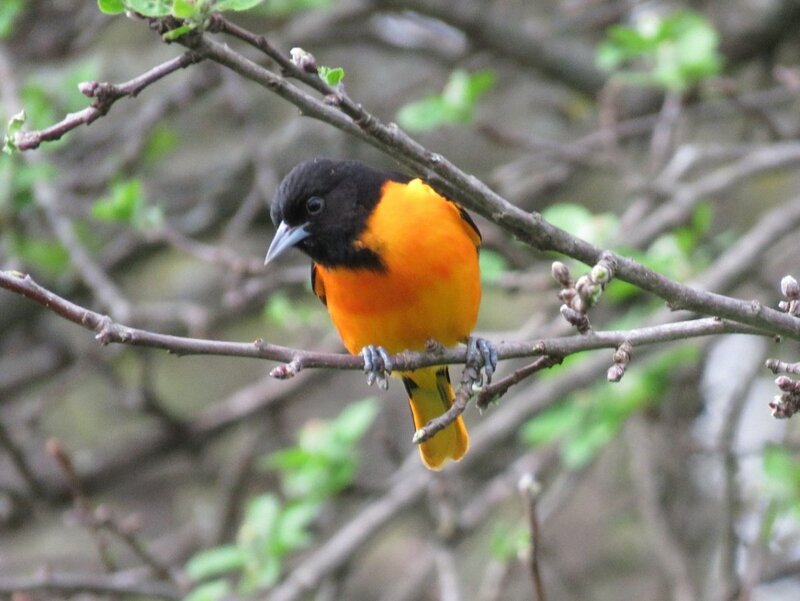 You may have some luck attracting it with it with citrus fruit or special Oriole nectar feeders. 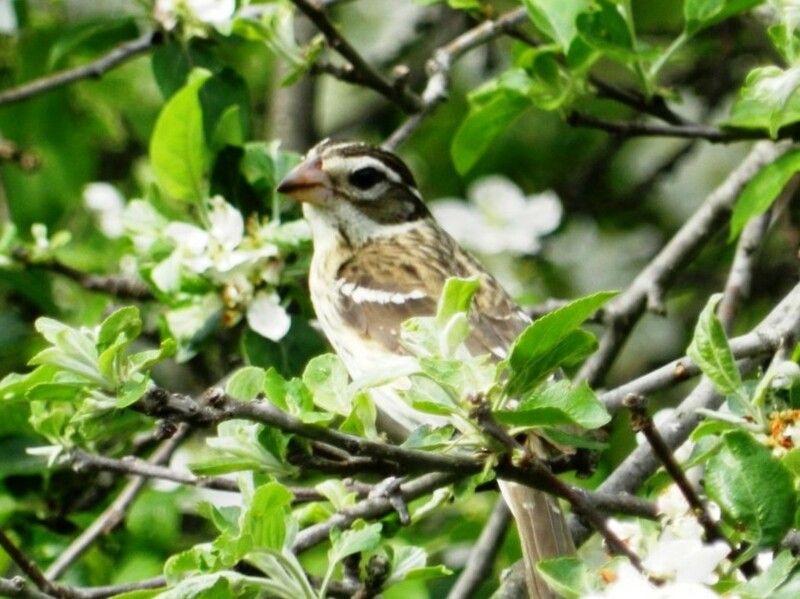 On my property I see this bird most often in the springtime, when the blossoms are out on my apple and pear trees. 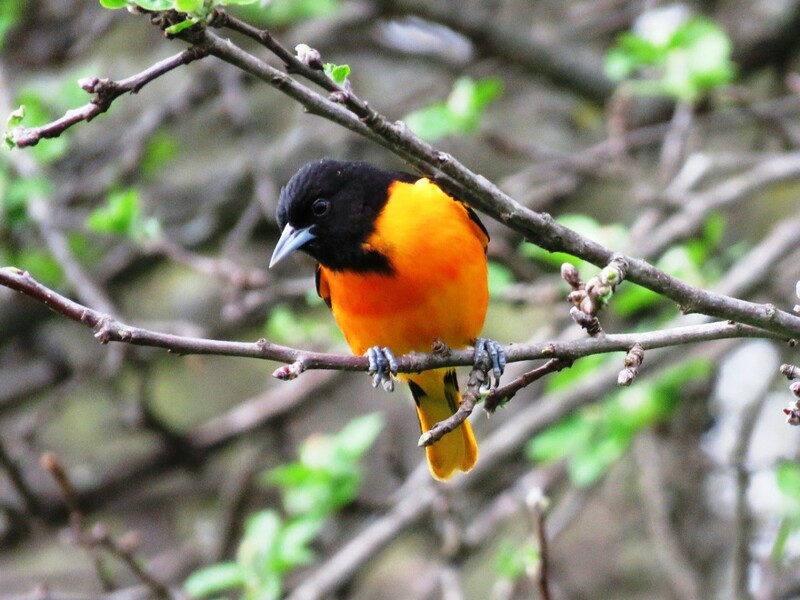 The Oriole will flit from branch to branch, merrily singing away as it examines the flowers. 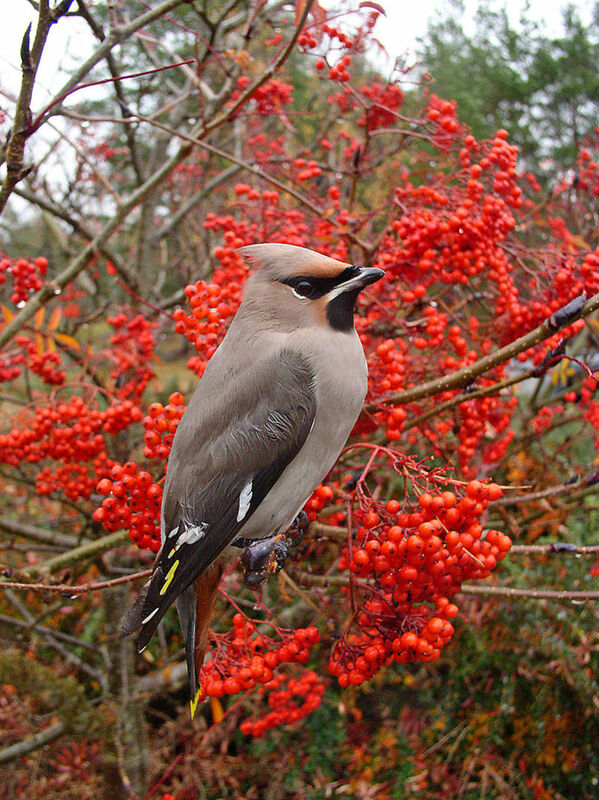 Males have a bright orange breast with dark black head and wings. Females have a more yellowish breast and lighter colors on the head and wings. One of smallest birds in your backyard is also one of the boldest. 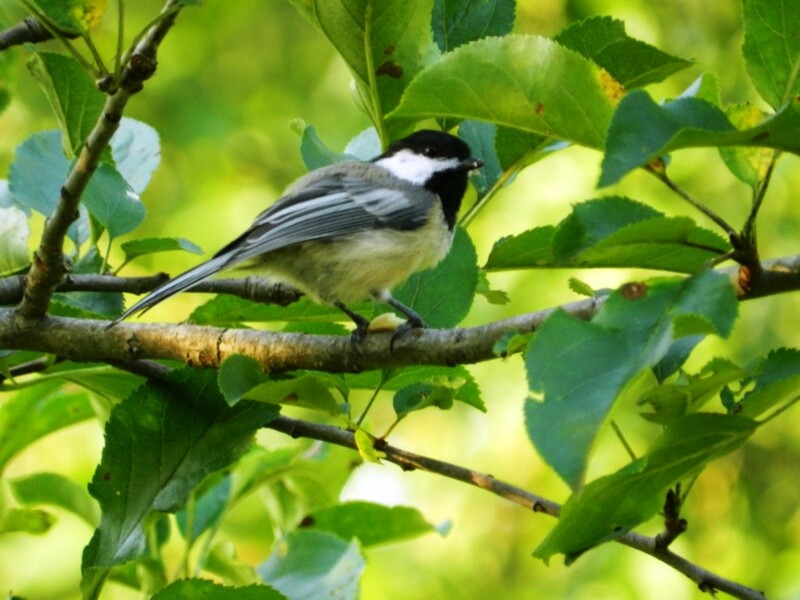 The Black-capped Chickadee is extremely tolerant of humans, and has even been known to take food from a person’s hand. Chances are you are already familiar with the song of this little bird, whether you know it or not. The familiar two-tone whistle and chick-a-dee-dee-dee are common sounds throughout the Northeast. 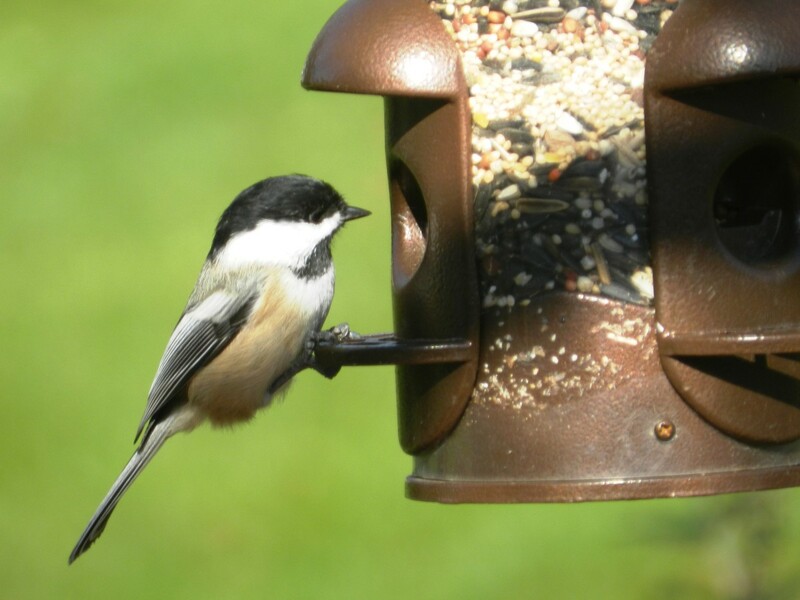 The Black-capped Chickadee is very easy to attract with a simple feeder and seed mix. 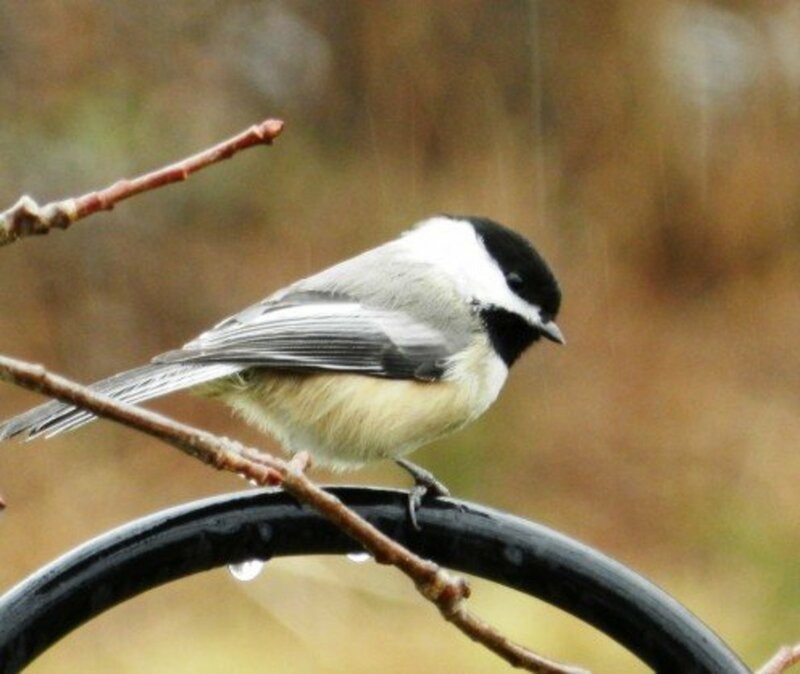 You may wish to use a smaller tube feeder for species like the Chickadee, Goldfinch and other small birds, to prevent larger bully birds from pushing them around. Speaking of bullies, the Blue Jay is a bird that has somewhat of a reputation as the bad guy of the backyard. 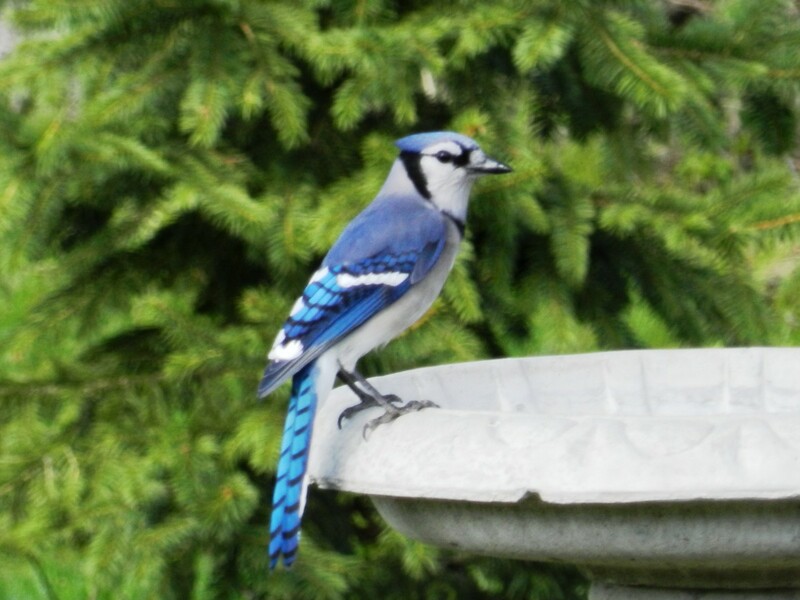 It’s easy to see why: Blue Jays are highly intelligent and larger than most other songbirds. They use these tools to their advantage, sometimes chasing away other birds or even attacking their nests. But the Blue Jay’s smarts also serve to help other bird species. Blue Jays are often the first to sound an alarm when a predator is near, and their loud communication can alert other birds to a food source. There are several sparrows in the Northeast, and sometimes they are a little tough to tell apart. 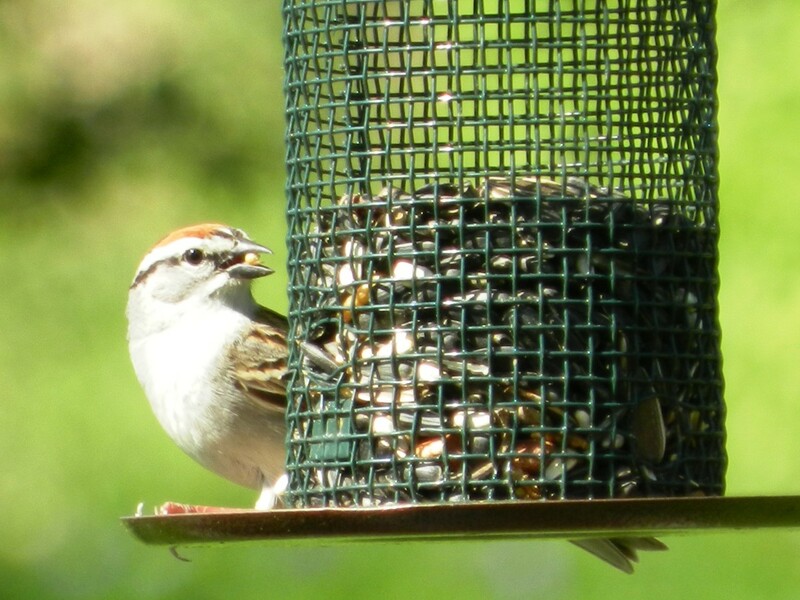 The Chipping Sparrow is among the most common, and can be distinguished by its reddish-brown cap, relatively white breast and defined markings. This little bird has no trouble mingling with other smaller birds at your feeder, or foraging on the ground underneath, but you will also see it hunting insects in the branches of trees. You will often hear the Chipping Sparrow chirping away or “chipping” from the tops of trees, and this is presumably where it gets its name. 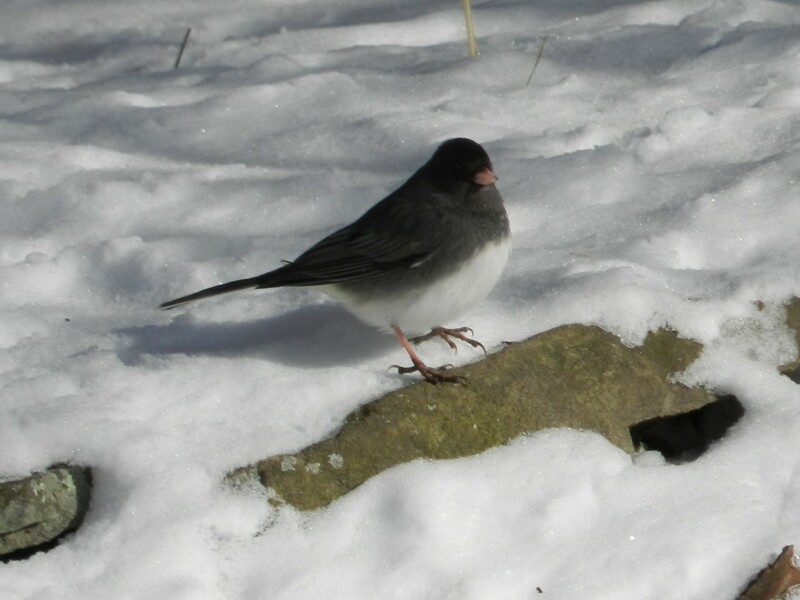 The Dark-eyed Junco makes an appearance in the Northeastern United States during the winter months, though I have occasionally witnessed a lone Junco sticking around well into the summer. More typically, this bird will be gone by late spring, having returned to its summer breeding grounds in Canada. These guys are easy to spot as they will congregate on the ground beneath your feeder to forage for seed. Their dark-gray backs and light-colored bellies make them stand out, especially if there is snow on the ground. In fact, some people in my area call them snowbirds because they are so visible in winter. With its quirky behaviors and sharp black-and-white plumage the Downy Woodpecker is one of my favorite birds. It may seem shy at first, but once it identifies your feeder as a place to find a good meal you will see it coming around quite often. 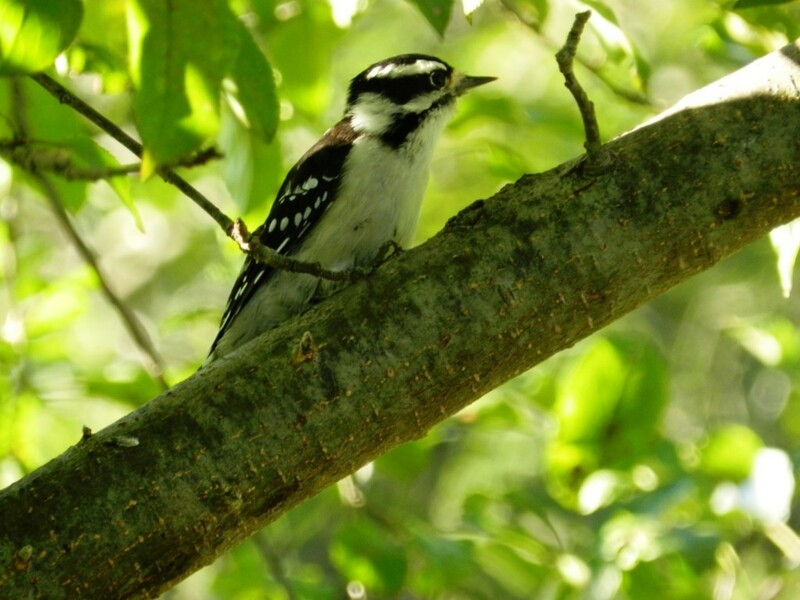 You may also see the Downy Woodpecker coming around if you have a few dead trees on or near your property. It will drum away in search of insects, and for such a small bird it sure can make a racket! Also be on the lookout for its larger and rarer cousin, the Hairy Woodpecker. These birds look nearly identical aside from their size. 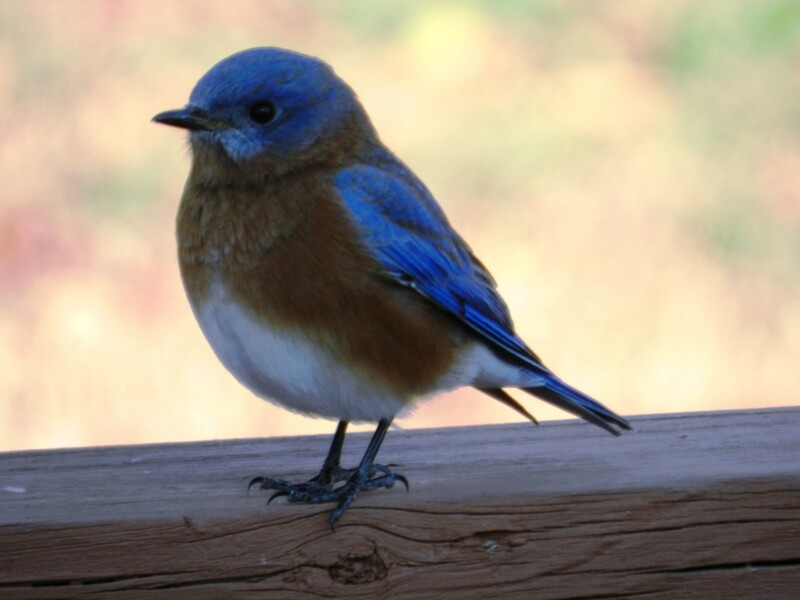 The Eastern Bluebird is an insect-eater with easily recognizable bright-blue plumage. You may see it hunting it nearby fields and lawns, or perching on poles or trees as it surveys its domain. This beautiful bird has suffered in years past, but in recent times has seen a resurgence in its population. One thing people can do to encourage Eastern Bluebird population growth is put up a Bluebird nesting box. However, if you choose to do so be sure to follow the recommended practices for nest box placement and management. 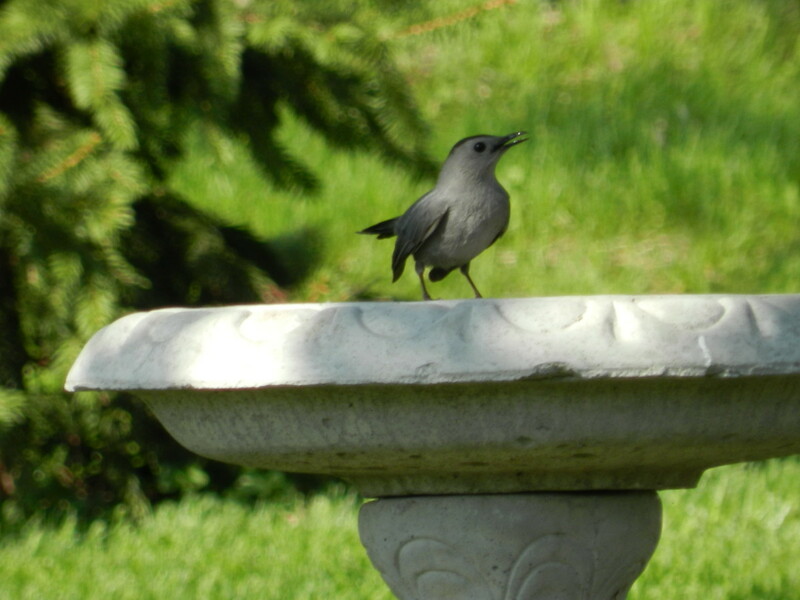 They Gray Catbird will have no interest in your seed feeder, but it may come to birdbaths. It will certainly appreciate gardens and shrubs for hunting if you choose to plant them. If you listen closely you’ll see how the Gray Catbird got its name. It mews like a cat! But that’s actually only one of the many songs you’ll hear out of this blabbermouth bird. More often it seems to blurt a disjointed string of chirps and whistles, and will make its presence known even when you can’t see it. These chubby gray birds look somewhat like miniature pigeons with prettier plumage. Their soft cooing can be heard from atop trees and telephone wires. 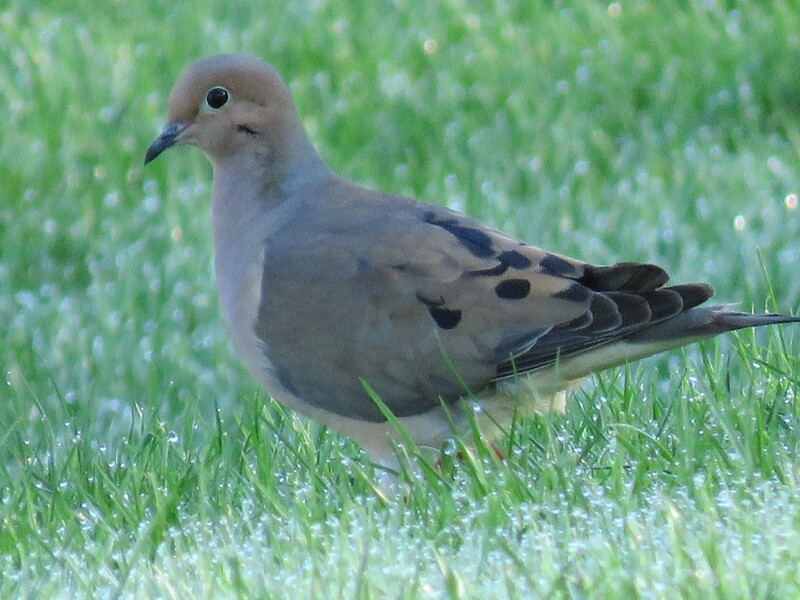 The Mourning Dove will clean up seed beneath your feeder, but may also attempt to land on larger, platform-style feeders. It’s comical to watch these strange birds wander around your yard, with their bobbing gaits and odd interactions between individuals. You will also notice a whistling whenever they take flight. This sound is not a vocalization, but actually comes from special feathers on their wings. 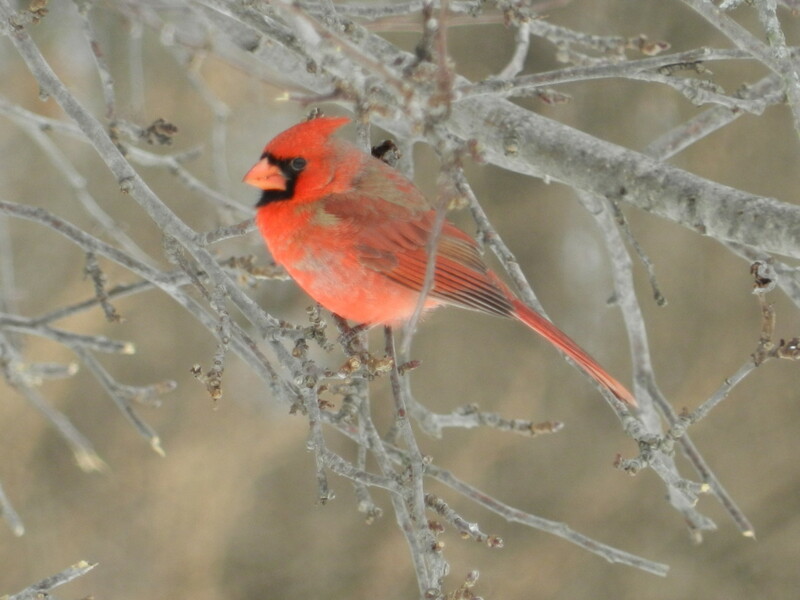 One of the most beautiful birds that will visit your yard is the Northern Cardinal. It is also one of the best singers! The males have bright red plumage, where the females are a more subdued brown coloring. You will often see them come to your feeder in pairs, male and female together. Sunflower seeds are a favorite of the Northern Cardinal, especially in winter. They are a common bird, and easy to attract. 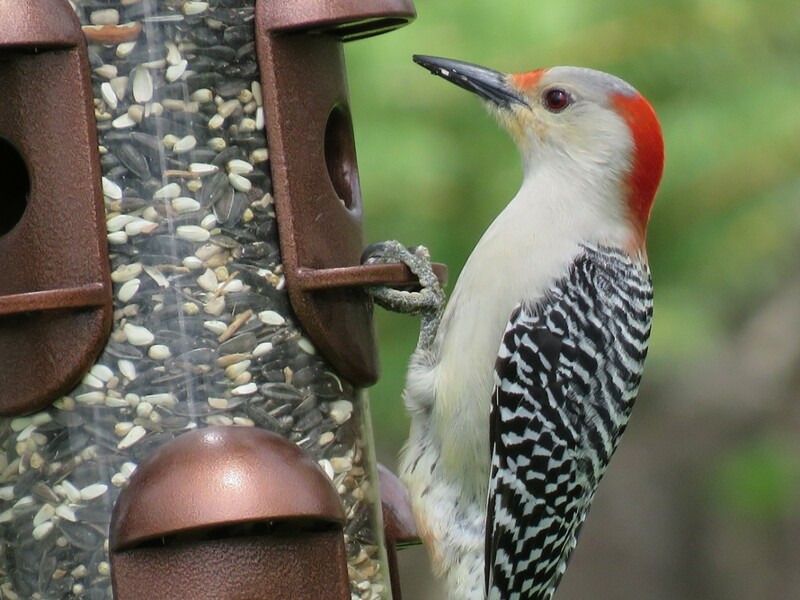 Be aware that smaller tube feeders may not accommodate this bird as it is not as acrobatic as other larger species like the Red-bellied Woodpecker, or as determined as the Blue Jay. If you want to make your property comfortable for Cardinals, choose a feeder with larger perches. The Red-Bellied Woodpecker is an interesting bird with a range that reaches into the Northeast, though they are also common in the Southeastern United States. These birds are a frequent visitor to my feeder, and are adept at clinging to branches, trunks of trees and even doing some gymnastics on the feeder itself. You’ll recognize its trilling call around your home once you are familiar with this bird. But don’t make the mistake of calling it a Red-headed Woodpecker despite the red cap on its head. That’s a different bird altogether! A migrant that spends its winters in a tropical paradise, the Rose-breasted Grosbeak appears in the Northeast around mid-to-late spring. The males are hard to miss with their black-and-white plumage and red spots on their chests, but identifying the female is a little tougher. She has brown and white plumage, more like a sparrow, but once you know her you will see her as often as the male. 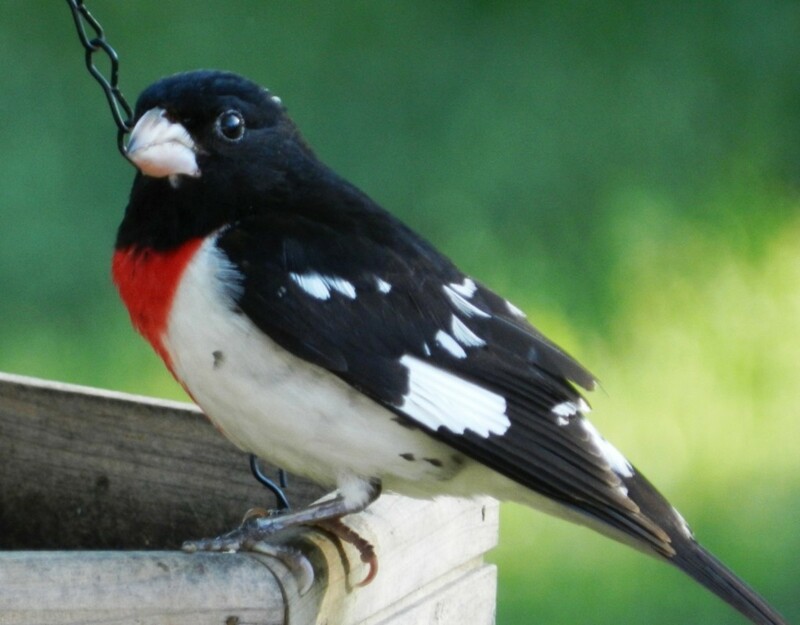 The Rose-beasted Grosbeak is a shy bird, but once it finds your feeder it will be a frequent visitor. 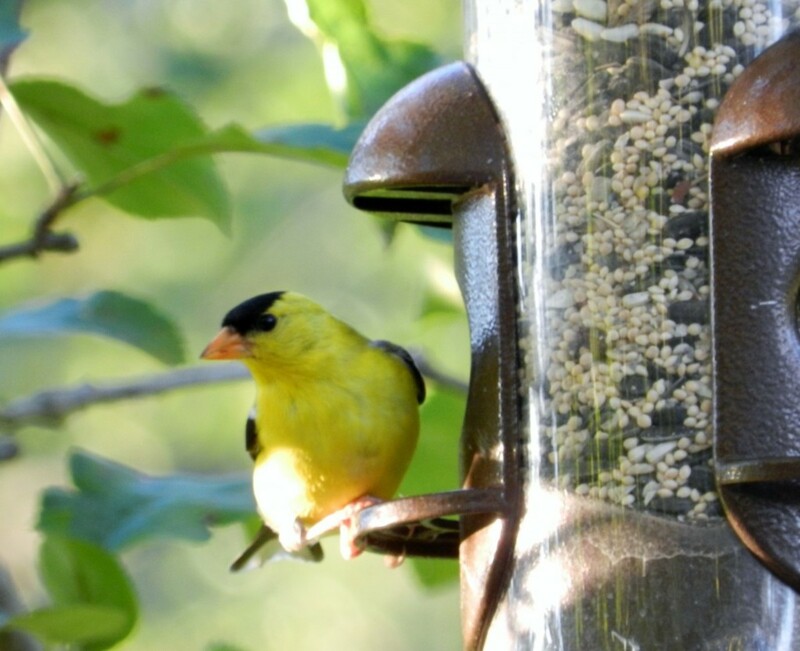 A basic feeder with a good seed mix is all you need to bring this world-traveler to your doorstep. 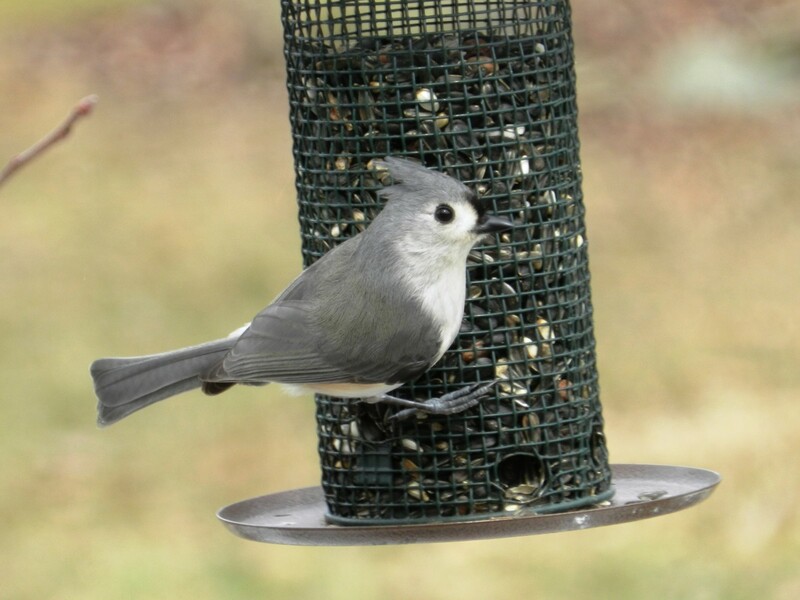 Along with the American Goldfinch, Black-capped Chickadee and Chipping Sparrow, the Tufted Titmouse is among the littlest visitors that will come to your bird feeder. It is easy to recognize by the “tuft” atop its head, and looks somewhat like a tiny, gray Blue Jay. Like the Black-capped Chickadee, the Tufted Titmouse has a fondness for sunflower seeds. Both birds will steal away a single seed from your feeder, and take to a nearby branch to crack open and consume before returning for another. The White-breasted Nuthatch is a small bird with black, gray and white plumage. It is notable for moving down the trunk of a tree head-first. It will be happy to come to your feeder for a standard seed mix, but will also enjoy suet and especially peanuts. Keep an eye out for the White-breasted Nuthatch hunting along the trunks of nearby trees. It will search the bark for insects and manage to configure itself in some bizarre positions along the way. All of the birds in this article were photographed on or near my property. I’ll be adding more when I get some better pictures of a few different species. I hope you enjoy spotting these interesting songbirds as much as I do, and if you live in the Northeast you should have no trouble bringing them around. If you want to learn more about the birds that visit your feeder every day check out the FAQ below! Birds have been classified as warm-blooded vertebrates. 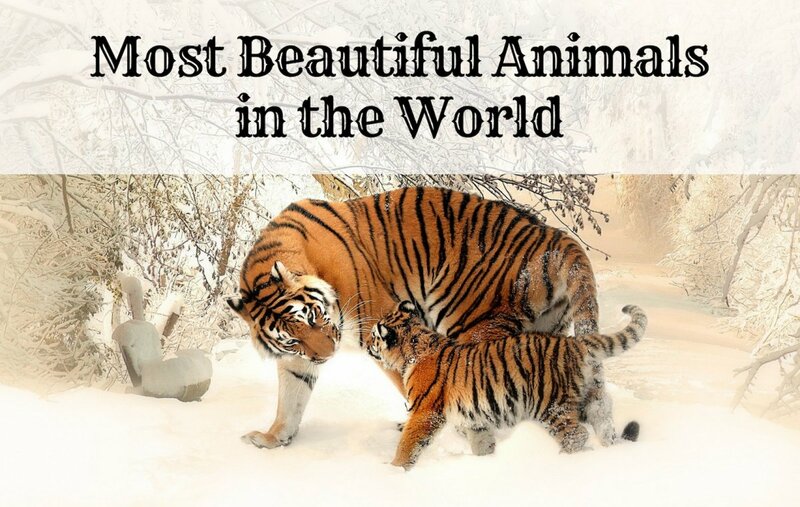 They have three characteristics that seem to set them apart from other animals. They have feathers, hard-shelled eggs, and hollow bones. Their feathers are used to insulate the bird from the cold. While birds originated from dinosaurs, they are not as closely related to reptiles as one might think. Their wings caused a massive evolutionary divergence that was such a successful adaptation that today there are nearly 10,000 different species of birds. What Are the Special Features That Help a Bird to Fly? The shape of a bird’s wing is very important for producing lift. The increased speed over a curved, larger wing area creates a longer path of air. This means that the air is moving more quickly over the top surface of the wing. This reduces the air pressure on the top of the wing and creates lift. Also, the angle of the wing (which is tilted) deflects air downwards. This causes a reaction force in the opposite direction and helps create lift. Lightweight, smooth feathers: This reduces the forces of weight and drag. A beak (instead of heavy, bony jaws and teeth): This reduces the force of weight. An enlarged breastbone: This helps with the force of thrust. Light bones: A bird’s bones are basically hollow with air sacs and thin, tiny cross pieces to make bones stronger. The lightness of their bones reduces the force of weight, making it easier to fly. A rigid skeleton: This provides firm attachments for powerful flight muscles. It also helps with the force of thrust. A streamlined body: This helps reduce the force of drag. Wings: These enable the force of lift. 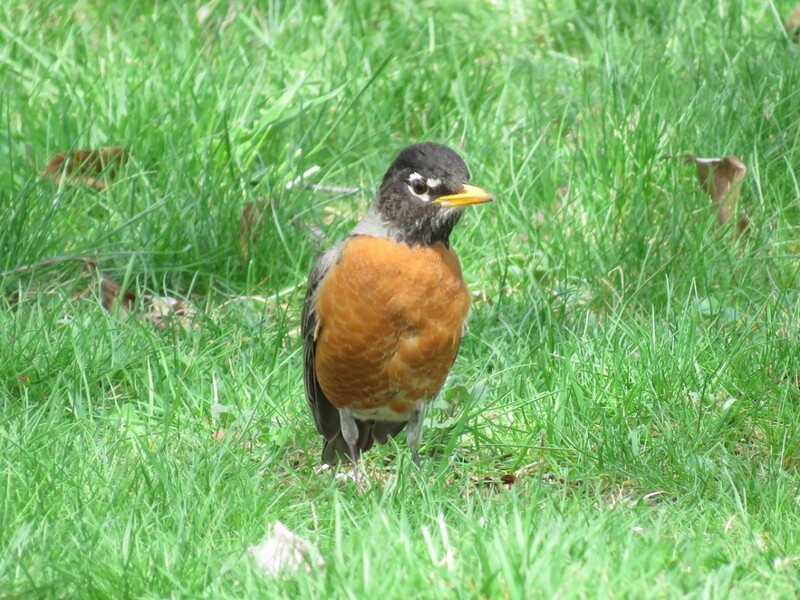 There are an estimated 300 million American robins in North America. The red-winged blackbird is a passerine bird of the family Icteridae found in most of North America and much of Central America. The yellow-rumped warbler is a North American bird species combining four closely related forms: the eastern myrtle warbler; its western counterpart, Audubon's warbler; the northwest Mexican black-fronted warbler; and the Guatemalan Goldman's warbler. The mourning dove is a member of the dove family, Columbidae. The bird is also known as the American mourning dove or the rain dove, and erroneously as the turtle dove, and was once known as the Carolina pigeon or Carolina turtledove. It is one of the most abundant and widespread of all North American birds. Population estimates range from as low as 100 million and as high as 475 million. The dark-eyed junco is a species of the juncos, a genus of small grayish American sparrows. This bird is common across much of temperate North America and in summer ranges far into the Arctic. It is a very variable species, much like the related fox sparrow, and its systematics are still not completely untangled. Estimates of 150 million, 200 million or even more. The American robin is a migratory songbird of the true thrush genus and Turdidae, the wider thrush family. It is named after the European robin because of its reddish-orange breast, though the two species are not closely related, with the European robin belonging to the Old World flycatcher family. The common starling, also known as the European starling, or in the British Isles just the starling, is a medium-sized passerine bird in the starling family, Sturnidae. It is about 20 cm long and has glossy black plumage with a metallic sheen, which is speckled with white at some times of year. The chipping sparrow is a species of American sparrow, a passerine bird in the family Passerellidae. It is widespread, fairly tame, and common across most of its North American range. There are two subspecies, the eastern chipping sparrow and the western chipping sparrow. The red-eyed vireo is a small American songbird, 13–14 cm in length. It is somewhat warbler-like but not closely related to the New World warblers. 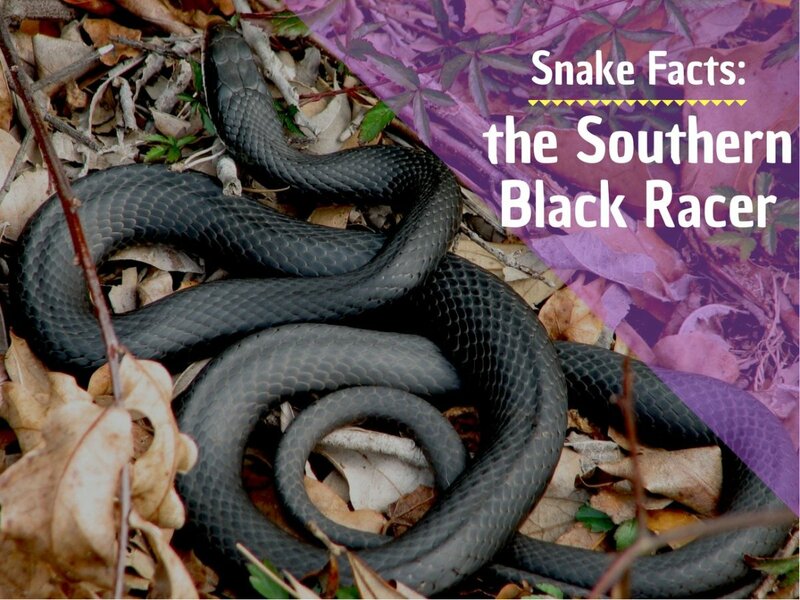 Common across its vast range, this species is not considered threatened by the IUCN. Swainson's thrush, also called olive-backed thrush, is a medium-sized thrush. It is a member of genus Catharus and is typical of it in terms of its subdued coloration and beautiful voice. Swainson's thrush was named after William Swainson, an English ornithologist. Pigeons and doves constitute the animal family Columbidae and the order Columbiformes, which includes about 42 genera and 310 species. They are stout-bodied birds with short necks, and short slender bills that in some species feature fleshy ceres. 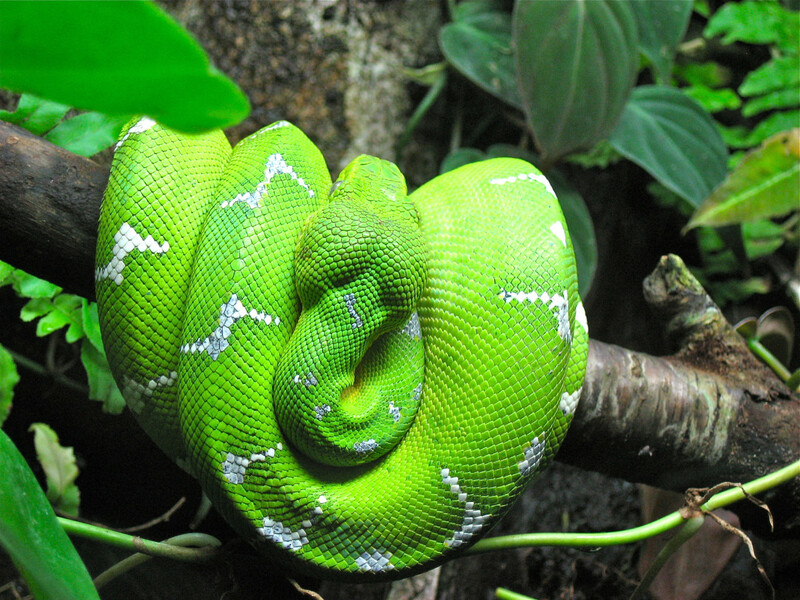 They primarily feed on seeds, fruits, and plants. 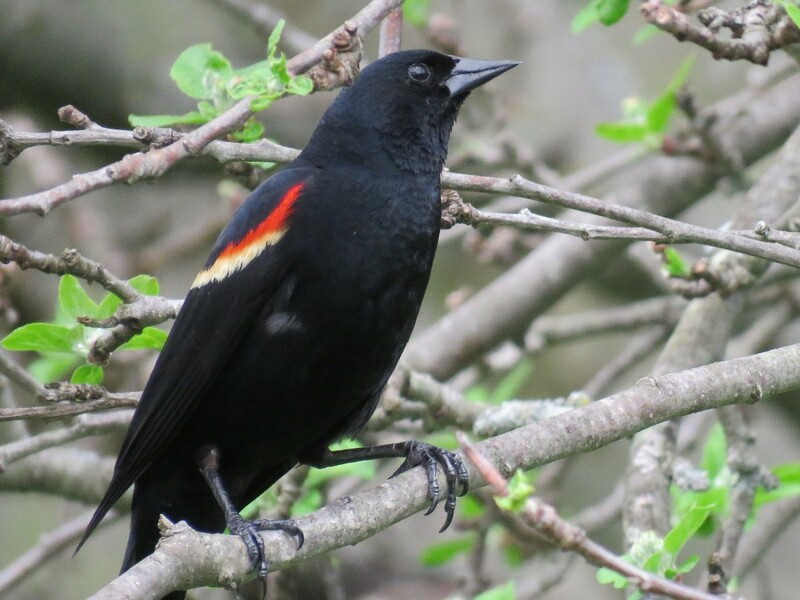 The red-winged blackbird is one of the most common birds in North America. Feathers: Feathers give birds their shape and color. Underneath the contour, feathers are soft and fluffy down feathers. These down feathers provide most of the insulation birds need in order to stay warm. Birds' feathers are also used for reproductive purposes. The color and shape of feathers can be used in mating displays. Wings: Flight became essential for gaining higher ground, seeing new prey, and fleeing from predators. The shape of wings is an evolutionary marvel. The wing shape helps the air move above and below, causing lift and keeping the bird in the air. A birds' feathers can also help it fly. Air rushes through the feathers, creating even more lift. Warm blood: Warm bloodedness evolved as an internal heating source that allowed an animal to move to new climates and survive in cold temperatures. Warm blood is used to keep the inside of their bodies at a constant temperature. 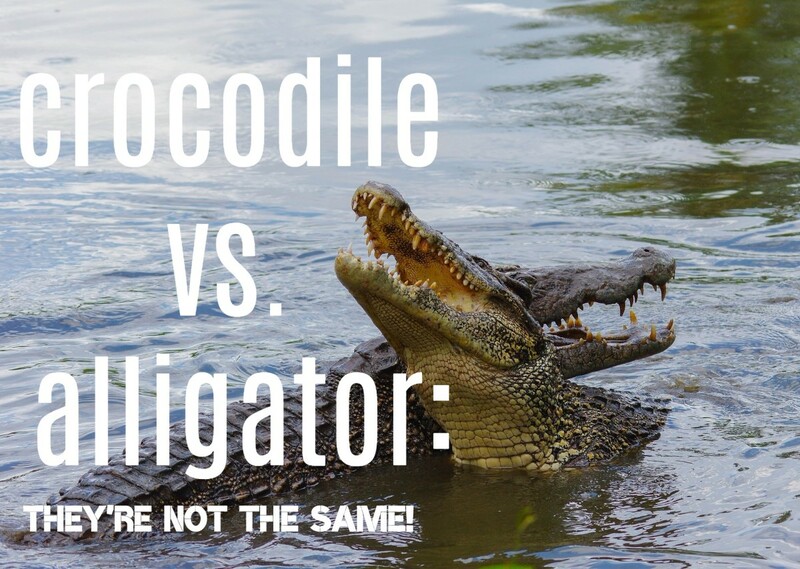 Warm-blooded animals do this by generating their own heat when they are in a cooler environment, and by cooling themselves when they are in a hotter environment. For birds that fly at high altitudes, this is absolutely essential. How Does a Bird Attract a Mate? Some birds court one another using dances and by building nests. Other birds use sound to attract their mates. They do so with a song or repertoire of songs. From dancing to eating to nest building, birds have a diverse array of courtship rituals. In a human social context, a courtship display/ritual is the period of time that potential mates spend getting to know one another before agreeing to a relationship, such as a marriage. While birds don't have a concept of "marriage," many birds do mate for life. This means that becoming skilled at courtship is of vital importance to young birds. Do Birds Love Each Other? Birds have many complicated ways of communicating with each other. Even when they are kept as pets in a cage, the birds form a relationship that is heightened. Birds will protect each other, engage in acts of affection and, when separated, may incessantly vocalize until reunited. Birds would have trouble flying if they had to carry the baby in their wombs like humans do. The current theory about why birds evolved to lay eggs suggests that bird embryos get more air and develop into healthier chicks by being laid as eggs than they would if they developed inside their mother's body. The Downside of Laying Eggs. Eggs can be stolen by scavengers. The mother has to warm the egg using her body heat. The mother has to protect the egg. The mother hunts or scavenges less because she has to stay close to the egg. Audubon, "Guide to American Birds"
@maureen - That's wonderful to hear! I'm glad you found this article helpful. I know it's an amazing feeling when you can name the birds and their songs. It's like it makes you feel closer to them or something. Hi John. I assume they are feeding on the ground. (?) The only thing you can really do is sweep up under the feeder a couple of times per day so they stop coming around. I also find that tube feeders prevent food from falling to the ground much better than hopper or platform feeders. If you are using a ground feeder and the ducks are taking over there isn't much you can do aside from removing the feeder. It is especially important to keep ducks and geese from relying on bird seed or other human-supplied foods, so I hope you can get it sorted out. I have had too many ducks and geese eating from my bird feeders this year. What can I do. 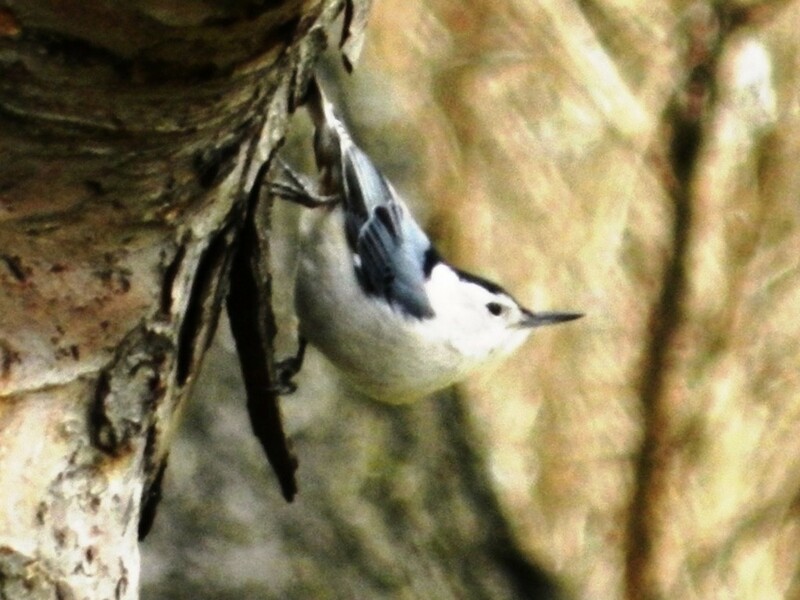 I live in southeastern, pa and I a female white breasted nuthatch that visits my feeder. I've gotten a lot of different birds this year. Thanks, this was a big help, I had to identify a bird on my deck, and I found the answer here! Thanks so much!!!!!!!! @Buck - I agree. I haven't seen many around in recent years though. There used to be big flocks of brown-headed cowbirds under my feeder every day. @Kathleen - Are you feeding sunflower seeds? They love them this time of year. You ought to be seeing them around. I wonder if there is another feeder nearby they are going to. I live in north east pa.--and have seen NO chickadees or nut hatches this winter?? Has anyone else noticed? Hi Ann. For little birds like those in this article I would think the lines would be a relatively minor risk. For larger, migratory birds, they can pose a potential problem. And of course there is the issue of alteration and degradation of habitat. Now is the time to ask questions of those who are overseeing this project. Hopefully some local environmental groups are paying attention and asking questions as well. Such as: What studies have they done to assess the impact on wildlife, or what studies do they have planned? Do they have any idea which species are vulnerable in the area and have they considered this in their planning? Progress is a good thing, but sometimes those in charge need a little encouragement to make sure they are seeing all the angles. Good luck! Tonight I'll be attending an open house regarding a new High voltage transmission project that is planned for both Southern York County PA and Harford County, MD. I'm concerned about the environmental impact these transmission lines could make upon wildlife habitat and waterways/vegetation/etc. Any thoughts about this? @Karen: Thank you so much! I have a few more birding articles planned for the future, but I write about other topics as well. I loved your commentary and pictures. I joined just to follow your posts. I look forward to seeing more of your posts. I am not really sure how to follow your posts, but will try. @Tom: Sounds like a male Brown-headed Cowbird. They used to be all over the place where I live but I don't see them much anymore. They'd come in small flocks and clean up the seed under the feeder. Saw a few in my yard this spring and none since. Females have a lighter brown/gray-colored plumage. I'll note that I've made a serious effort to reduce the seed that lands on the ground under my feeder over the last few summers, so that's may be part of why I don't see them so much too. Thanks Harry! I appreciate the kind words! I love Pennsylvania and love the songbirds of this state. Several or perhaps all of them are also present in southern Ontario too. Very well written hub with great shots. visiting second time, the birds are cute, good going!!. I love those gray catbirds! It cracks me up when they "yell" out people's names. Always sounds like they're calling for somebody named Eric or Aaron. Hard to miss once you hear it the first time! Thanks for the article, good informative stuff and lovely pictures. Are the photos your own? Because they are very good. The descriptions of the birds are helpful too. Great hub! Good luck with your bird photography Suhail! There are a few things I do to avoid trouble with mice. I try to keep the area beneath the feeder clean. I also take my feeder down every night. I do this because of bears, but I also think it helps deter mice and other nocturnal critters. And I have a sturdy and secure container to store the extra seed, since mice will chew right through a plastic bag. Very useful and interesting hub! I am about to hand a bird feeder in my garden for doing some serious bird photography and this hub turned out just in time for me. The only reason I am skeptical about having a bird feeder in my garden is that it may attract mice. EricDockett I would love to show our beautiful birds. I love birds. I liked your hub and the pictures! Voted up! Beautiful! Thanks for your kind comment, Gwennth! I'd love to visit Australia and see some different bird species some day! Loved your article about Common songbirds. The birds are beautiful and they are all different to the birds in Australia where I live.